Today, I have on an outfit from Zenith and new shoes from First Flower. 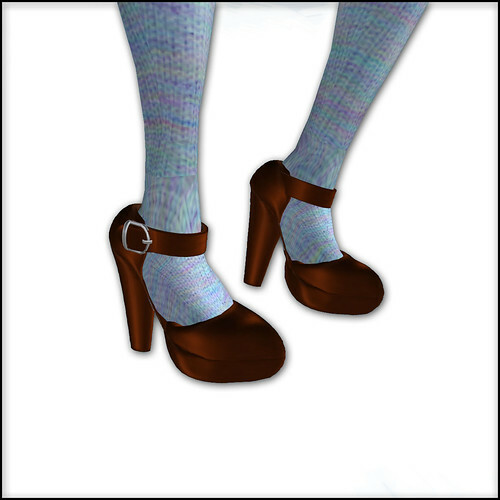 These are the first shoes that Severina has made in a while, and they remind me of an adorable mary jane version of Schadenfreude's Lucent Bow Heels (photo below). The top and suspenders tickle me. I usually don't wear "flash mah bewb" shirts, but I totally got inspired by Ashia's awesome boobiness. Looks good with tattoos that are usually hidden by shirts! My necklace is an item from (Silver Wheel), and I fail to properly display it. Despite this I really like the playful heart motif, and I'm sure I'll stick it on in a blog post again. The hair is new from /artilleri/, and I swear I bought it before Ashia did :D.